We’ve just been to the new Byron at the Corn Exchange in Manchester, you know the place opposite the weird angled big glass building, once Urbis now the National Football Museum? Merry Cheesemas – annual celebration of the great art of festive indulgence to make Christmas extra-cheesy. 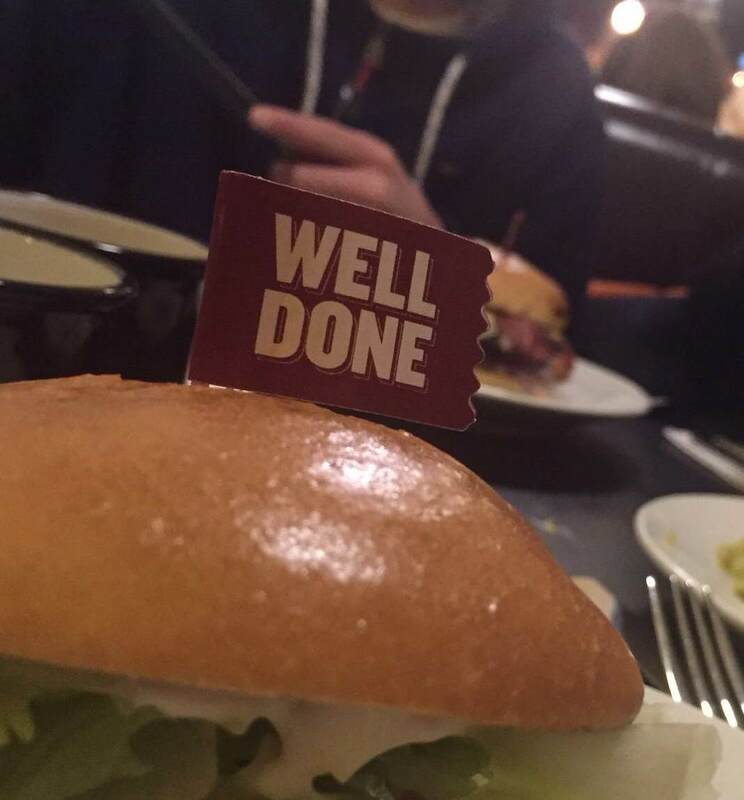 Asking my family if they would like to go out for burgers is a total no-brainer, so we were soon seated and ready to order. All week the children had been asking “when are we were going to ‘Brian’?” and I’d told them many times “it’s Byron!’ but Brian seemed to stick! I love places where you can have what you like, how you like it and that goes for all of us; take note of the chips picture of which four different kinds were ordered. I’ve had an In & Out Burger in LA and been to US import Shake Shak in London, both of which do good burgers, but since moving North a few years ago I’ve yet to find a place that does a great burger. When I say great burger, I hate the type that are so big you can’t pick it up to eat, the one’s full of added extras you didn’t want (who wants pulled pork on top of a burger?!) or have a horrid white flabby bun with too much lettuce or so big you have to unhook your jaw. None of that here I am pleased to say. Whilst waiting for our food my 8 year old dragged his teenage brother around the restaurant ‘looking for cows’, one of the activities from the children’s activity sheet. And this is a small thing which makes all the difference, the crayons supplied were actually sharp, not broken and had many colours to choose from – yey! 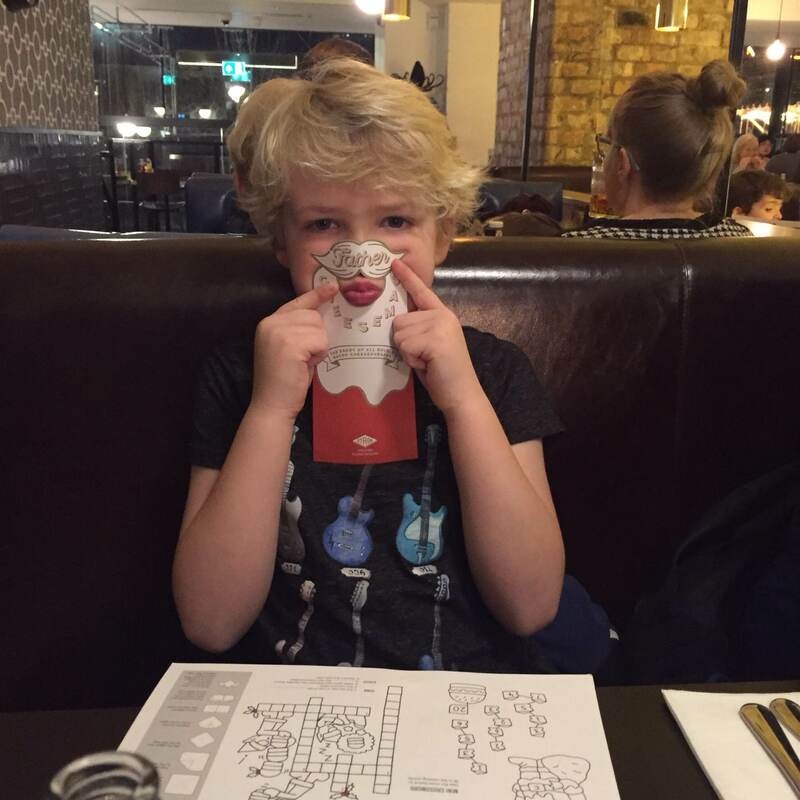 It’s a bugbare of mine that restaurants that do children’s activity things often give you a rubbishy pot of stubby ends of manky crayons and a yawnville word search; do it properly, do something different or don’t bother! 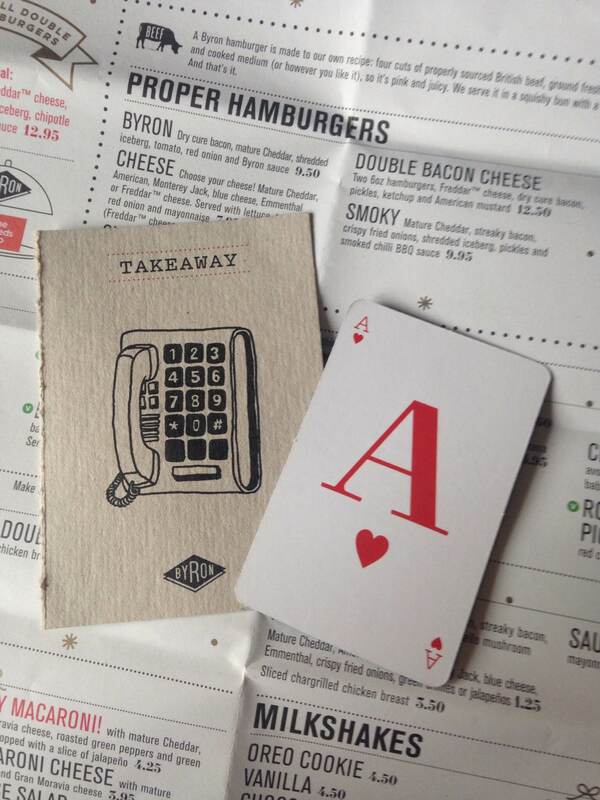 The menu, what does the A card mean? Each Byron is different in style and decor, my husband particularly likes the various craft beers in cans displayed near the kitchen and he spent quite some time having a look and tasting a couple. Byron say that beer in cans lasts longer, tastes better and is fresher and my husband agrees. With a delightful selection of craft beers to choose from such Brewdog’s Dead Pony Club Pale Ale, Brooklyn Lager and Kona Brewing’s Longboard from Hawaii (beer from Hawaii how cool is that? ), I had to smile when at the weekend I spied some artisan craft beers in cans in the fridge he’d purchased after being inspired. To start we had a massive plateful of nachos with melted cheddar, jalapeno, salsa and guacamole and sour cream, just THE best I’ve eaten in yonks. Normally the salsa burns your tongue off and the nachos are over salted and vile, but not these. Creamy sour cream, deeply tasty gucamole and rich tomato salsa which had flavour and lots of it; I ate three jalapeno just for medicinal purposes. We loved the fact you can have what you want how you want it, burgers are personal and everyone has their own way. 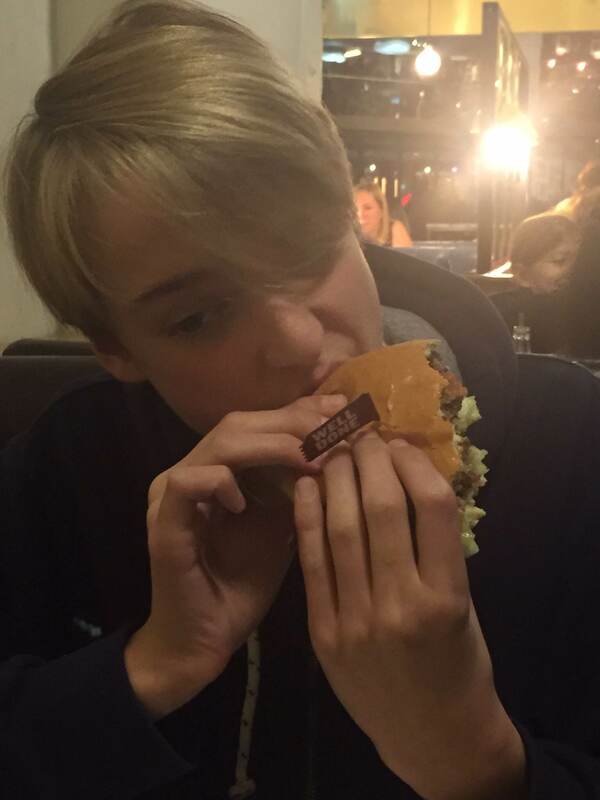 When my 13 years olds choice of cheeseburger with bacon arrived he got stuck straight in just as his plate was put in front of him; it’s the ultimate teenage food, you can just pick it up and shove it in. We did discuss our mutual dislike of red onion with the manager, so that was all discarded, but that is just our personal preference. 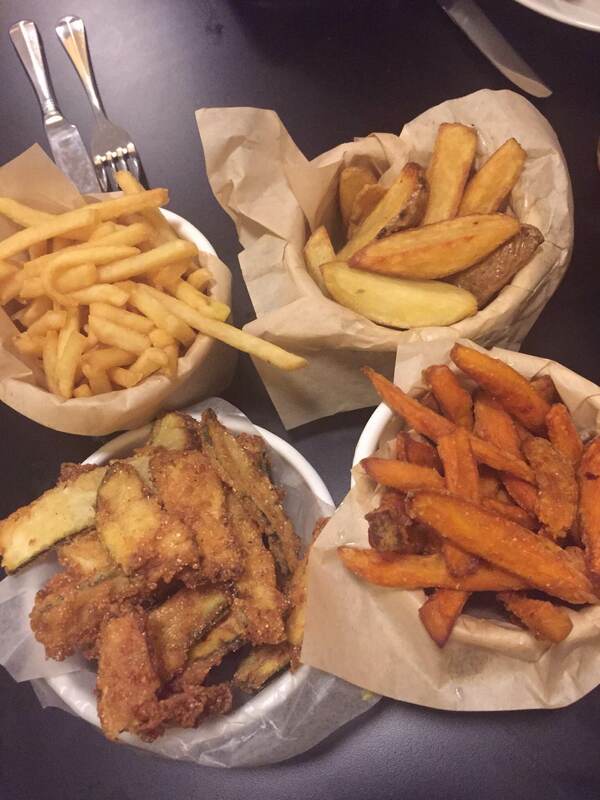 The varied choice is also reflected in our fries; my 8yo was over the moon sweet potato fries were on offer and was very reluctant to share even one (see pic for others). We all had a burger and fries, mine was blue cheese with crispy fired onions, sooooooo yummy. My husband had a Double Bacon Cheese, so manly and beefy and my youngest has a mini classic with extra bacon. My teenage son has a keen interest in graphics an design and loved the typface of the menu and the little orange booklet which explains the ethos behind the food. Pudding as we like to say in the North, were a caramel & honeycomb sundae and an Oreo cheesecake. Not my finest hour scrapping spoons with my children for the last mouthful of cheesecake (I lost). Byron offers a simple, yet rich menu full of choice, it did take us a while to each work out our perfect combo’s but we managed in the end. The place was busy and the staff were flying about like nobodies business; even the waitress looking after a table of what looked like a lively hen party kept her cool and smile as she ran about. In fact the whole team looked happy and switched on which made for a great atmosphere and service seemed effortless. “When are we going to Brian again?” was the question in the car on the way home. And the answers was “definitely soon” and this time I will get the last mouthful of cheesecake. Cafe Rouge Chester- tres bon! There is so much choice on the high street when wanting to go out to eat, quality and quantity are abundant as are the types of cuisine, you are more than spoilt for choice. One place I’ve over looked for years is Café Rouge and I am not quite sure why it slipped off my radar. There used to one in Putney (London) which was my go-to weekend stop, but since moving to Cheshire I had never been to one. 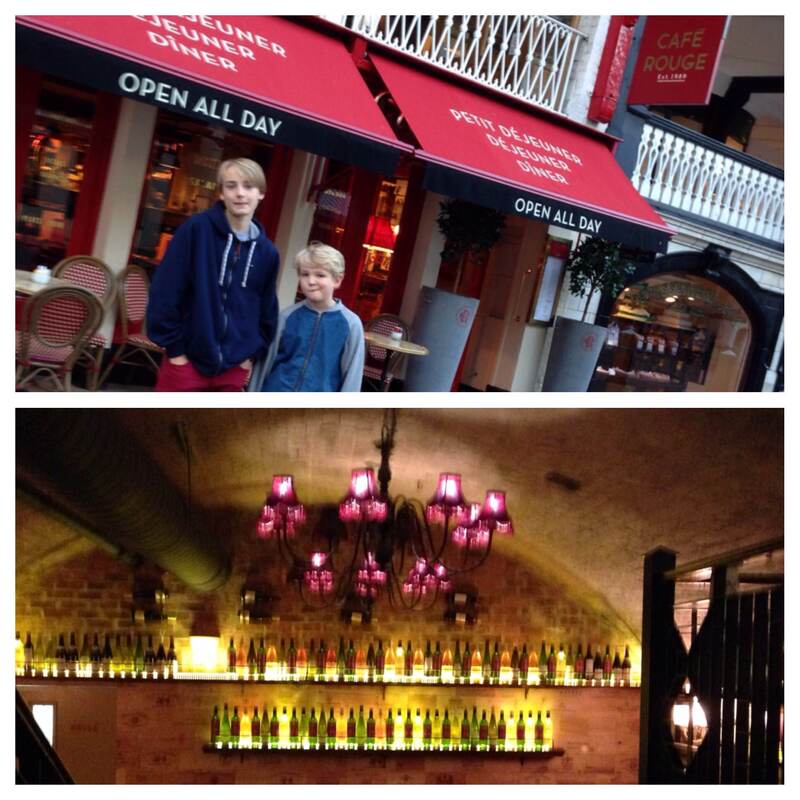 During half term I popped to Chester with the children to visit the newly refurbished restaurant on Bridge Street, to try to make friends again with this popular French restaurant. 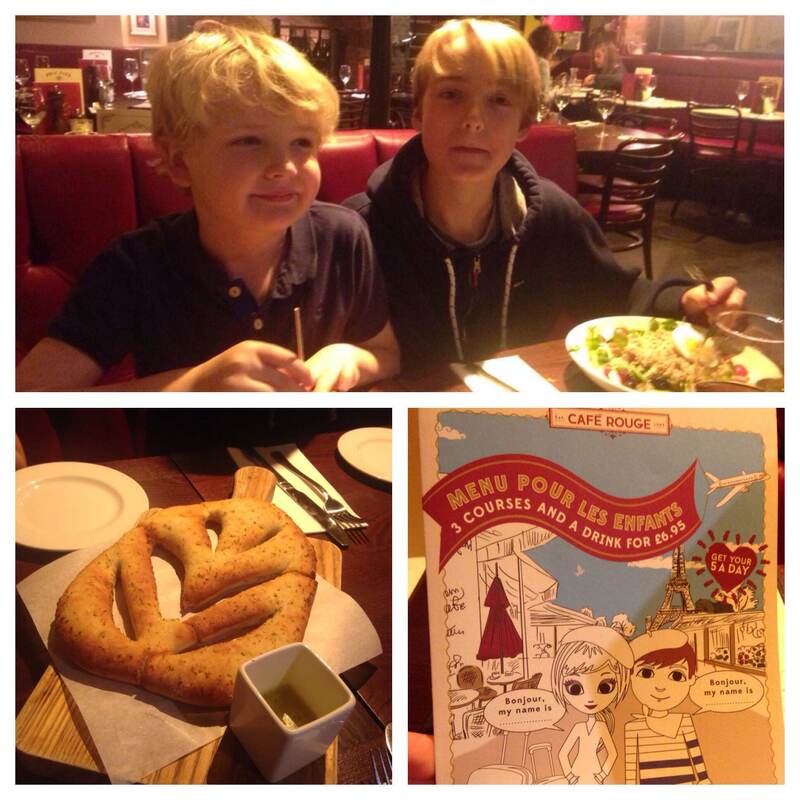 Our summer holidays had been spent on a French road trip so my boys (aged 8 and 13) instantly felt transported back to Paris in the cosy, soft lit, red interior. Just to ensure we covered all age groups my Mum (Grandma Sue) popped along for balance. My boys are always hungry so we got stuck straight into the menu and ordered drinks and garlic bread (see picture). We all grabbed some of the soft bread and dipped it into the melted warm garlic butter and the whole lot disappeared after about 3 minutes! My youngest who sometimes does not want to be seen as the baby of the family was more than happy with his crayons and word search from the little booklet provided. What I remembered I loved about Café Rouge was that you can go totally full on French with the food or just have a hint of something French. 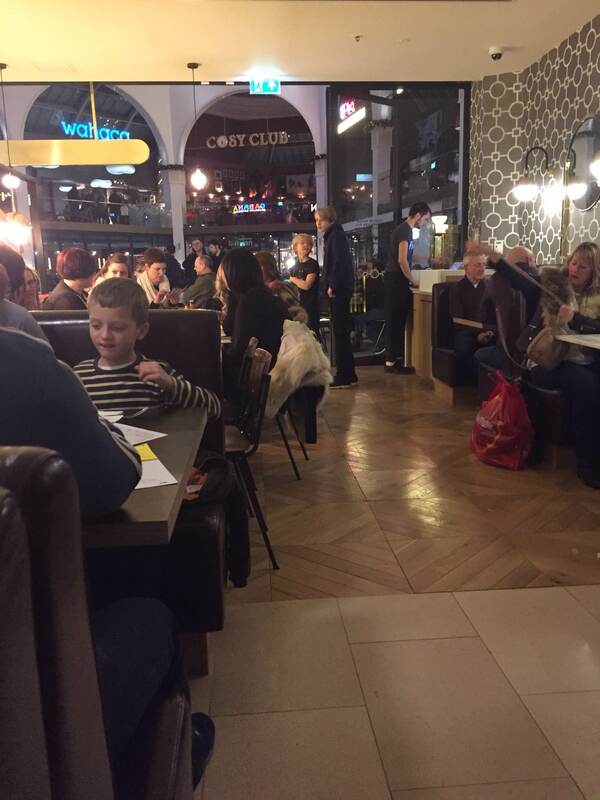 The staff were fab, smiley and effortless as they flitted between all the tables. Mum had a smoked ham and Gruyère cheese croque with fries; I had a Rouge Chicken Caesar, the eldest a Rouge Nicoise and the youngest a burger and friends from the kids’ menus. And what did we like? Well to be frank, everything! All fresh, hot and very tasty, we could tell care had been taken with the ingredients and prep. Kids’ menus love them or hate them, they are at necessity and of course some places, like Café Rouge, give them much more than an afterthought. There is lots to choose from and the expected stuff like burgers and chicken are done with care; the Petit Croque is just too darn cute! Only one teeny thing is that when the kids menu food arrived it was just there on the plate looking a bit boring, maybe a French flag could sit proudly atop of the burger, the plate could have a plate cover that echoed the cute characters of the activity pack or even the fries in a little basket. Just a few little extra touches would add that extra ‘je ne sais quoi’. If it were not for the children, I would have ordered more wine and sank back into the seating and soaked up even more of the ‘Frenchness’ of the chandeliers, weathered mirrors, subtle lighting and quite happily imagined myself back in Paris. But I had to settle for a shared delicious Crème Brulee with my Mum whilst the boys tucked into chocolate crepes with vanilla ice cream, which will definitely do for me any day of the week. With breakfast, Menu Rapid, fixed price, lunch and dinner menus available with an excellent range of desserts, wines and sides a visit to Café Rouge in the heart of Chester is a must for a ‘tres jolie’ time. We are definitely friends again and will be back to try breakfast very soon. http://www.caferouge.com/ Take a look here for your local Cafe Rouge. Christmas Day and New Years Eve menus are also available.